Land stewards Tao Orion and Abel Kloster provided background to the center. Aprovecho has been on this 40 acres of land since the early 1980s. The founders’ appropriate technology work, primarily designing and testing rocket stoves for developing countries, spun off perhaps a decade ago. (See my journal “A World of “Rocket” Wood-Burning Cookstoves”). Now the center demonstrates and provides educational opportunities for sustainable, localized, appropriate technology living. Above the gardens are two community buildings with photovoltaics, solar hot water and sufficient rainwater catchment (stored in a ferro-cement tank) to meet the needs of their workshop guests all year. Restoration forester Matthew Hall gave us a tour of their “managed ancient forest” (second-growth forest intended never to be cut), pointing out essential elements like snags and down logs which build soil. They use human- and horse-power to harvest logs, which are milled (and some solar kiln-dried) for building materials and fuel. We joined Jeremy Roth in the steamy hothouse to tape the aquaculture project for raising tilapia fish. Water with fish poop is pumped along the periphery of the hot house where algae and other pond plants are fed by the fish waste. The cleaned water eventually returns to the fish tanks. They’re also experimenting with plants that live entirely in water like water chestnut, and hydroponics (shallow beds of water-covered gravel.) You’ll love the moment when Jeremy jumps into the fish tank and nets a few. Heather Kalian and Brad Koehn’s green thumbs are creating a garden of edible wild beauty. They’re experimenting with turning the soil as little as possible, companion planting including the vertical dimension (pole beans above kale shading lettuce), three sisters and grains together (winter squash, corn, beans, oats, amaranth, buckwheat). We taped an entire show with Aprovecho’s sustainable shelter manager Chris Foraker in their community center. 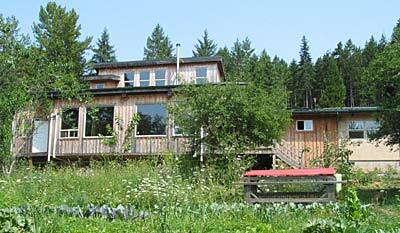 This natural building employs primarily materials from on site and many volunteer hands. Their sustainably-harvested forest provided pole trusses, cut lumber, flat-sided poles, and tongue-and-groove for wainscotting. Sand, straw, and clay from their ponds are combined to surface their walls and floors in a warmly organic plaster surface. Jeremy also highlighted their educational programs introducing sustainability to grade school kids (see where your food comes from! ), and working with high school students in their community to gain skills and work opportunities in sustainability trades like solar and energy efficiency. See what I mean about richness? It’s a place where earth stewards are exploring what local and sustainable can mean. We are all the richer for it.